Ami Barwell’s photography has taken her around the world and brought her face to face with some of rock and roll’s greatest legends (or should that be lens to face?) Now she brings her internationally renowned snaps to an exhibition in York for the first time. Rock ‘n’ Roll Photography by Ami Barwell takes place at Fossgate Social throughout next month, with a launch party on the 3rd of October. We caught up with Ami to talk smoking guitars, heavy lifting and her little known claim to fame. It’s an intimate exhibition of emotive imagery. It’s my first exhibition in York and a collection of my best and most famous work. The walls of the exhibition will be adorned with photographs of rock ‘n’ roll royalty. Iconic intimate portraits of Radiohead’s Thom Yorke, the legendary Ian Brown, through to Iggy Pop, Foo Fighters, Lenny Kravitz, The White Stripes, Johnny Marr, Black Rebel Motorcycle Club, The Darkness, Levellers, Fish from Marillion and Motorhead’s Lemmy will slap you in the face as soon as you enter the building. It’ll also include iconic album covers I’ve done: The Cribs, Interpol, The Cooper Temple Clause, Black Rebel Motorcycle Club and Sandi Thom. The exhibition will also preview the launch of an exciting new collaboration. I’m collaborating with an amazing woodworker, creating bespoke handmade furniture and large scale rustic artwork – for both indoors and outdoors – and hand-printing my photographs onto each wood piece, creating one-off collection pieces: rock ‘n’ roll wood. All photographs and pieces from the exhibition will be available to purchase. How would you describe your approach to photography? Honest, intimate, raw, passionate, gritty rock ‘n’ roll. Which of your shots is your favourite and why? That’s a really tough question. I have many favourite images for different reasons. 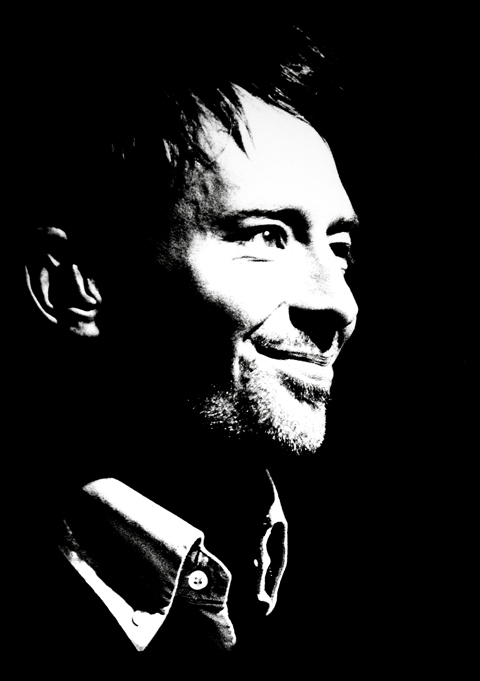 Probably either my Thom Yorke portrait, as it shows a side of him rarely seen in photographs: a delicate smile. 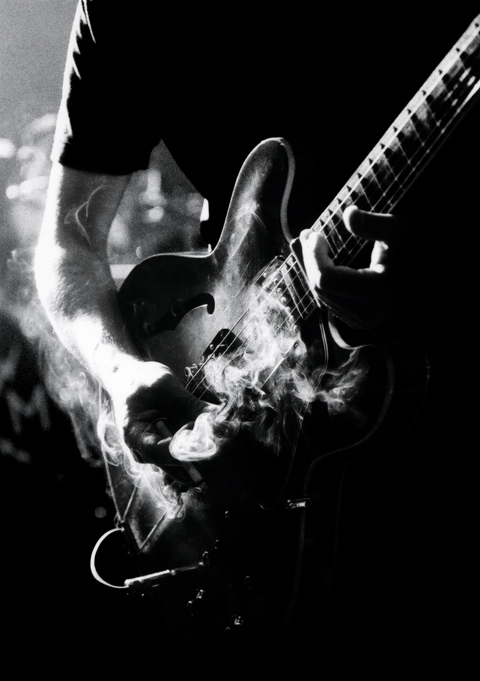 Or my Black Rebel Motorcycle Club ‘smoky guitar’ shot. It’s just everything I love about rock ‘n’ roll. What’s your favourite thing about being a photographer? Doing what I love and at the same time making people feel and look amazing. Carrying gear that weighs about 45 stone! Also trying to find enough hours in the day; I need a new agent desperately. What’s been the strangest moment of your career? Ooh, there’s plenty, but I don’t click n tell! What’s your opinion of the York music scene at the moment? RSJ are set to take over the world! What exciting stuff have you currently got in the pipeline? Along with the collaboration with the woodworker, I’m also launching a new clothing range, after the huge success of the ‘By Ami Barwell By Ben Sherman’ collection. You have a namesake who is the world record holder for balancing a spoon on her nose. Assuming it’s not you and you have a hidden talent, which world record would you like to have a go at? I do believe the correct terminology is ‘spoon hanging’. I have many hidden talents, hats off to you for good research! 2015 is gonna rock! Keep up to date with everything that’s happening on my website, Facebook, Twiitter and Instagram. Rock ‘n’ Roll Photography by Ami Barwell takes place between the Friday 3 October and Monday 3 November 2014 at Fossgate SOCIAL, with a launch event featuring live music on Friday 3 October at 7.30pm.